Governor Rick Perry took the lectern at the annual “Life & Liberty” fundraiser for the Texas Alliance for Life with a smile on his face. It was 2010 and he was in the thick of a re-election campaign, but this was not a crowd he needed to woo. “I kind of feel like I’m at a family reunion,” he told the audience. Perry’s presidential campaign may be doomed—it’s too early to count him out entirely—but the far-reaching effects of his disastrous decade as Texas governor are just beginning to emerge. For women, things look particularly grim. Perry has presided over a wave of anti-choice legislation that has shredded healthcare services for the state’s most vulnerable. It reached its apex during the 2011 biennial legislative session, which saw a dismantling of Texas’s budget to provide women—especially the poor and uninsured—with access to basic healthcare, including reproductive health and family planning. Texas already leads the nation in the number of uninsured residents. Gutting funds for basic preventive and reproductive healthcare means a rise in expensive Medicaid-paid births—along with, ironically, the number of abortions. Without funding for family planning, Texas can expect to see a 22 percent increase in the number of abortions, according to the Guttmacher Institute. This is the model for women’s health Perry would bring with him to Washington: a commitment to defunding basic health services. And while his chances may be slim, this is a mission also embraced by the Republican base, regardless of who ends up being the nominee. At the Values Voter Summit in October, Perry’s biggest applause came when he said he was “proud to sign a budget that defunded Planned Parenthood in Texas.” Most of the GOP presidential candidates have signed the Susan B. Anthony List’s Pro-Life Presidential Leadership Pledge, vowing to “select only pro-life appointees for relevant Cabinet and Executive Branch positions,” “to advance pro-life legislation to permanently end all taxpayer funding of abortion” and, of course, to “defund Planned Parenthood.” Although front-runner Mitt Romney has not signed the pledge, he did support efforts in Congress to defund Planned Parenthood earlier this year. Perry may not win the nomination, but he has demonstrated the political value of a hardline anti-choice agenda. When George W. Bush arrived in the Oval Office in 2001, Sarah Wheat was working for NARAL Pro-Choice Texas. She remembers getting phone calls from reporters and advocates across the country inquiring about the former governor’s record on women’s health issues. Despite his well-known religious views, “he didn’t have much of a record,” she recalls. “So it was much harder to gauge what he might do as president.” Even as Texas was moving to the right—a shift solidified by the 2002 Republican takeover and mid-decade redistricting battle spearheaded by then-Congressman Tom DeLay—the Texas Capitol in those days was a far more moderate place. Most people, regardless of whether they were willing to proclaim it from the stump, understood the benefit of funding preventive healthcare and family planning for women. In 2005 Perry signed into law two significant budget riders that together set in motion his priorities for women’s health. The first set aside $10 million a year from the state’s family-planning budget for so-called Federally Qualified Health Centers (FQHCs), one-stop shops that aim to give all low-income uninsured people a “medical home” using federal dollars. Created by Bob Deuell, a doctor and a Republican state senator, the rider’s logic was that such centers provide broader services for the neediest populations than, say, Planned Parenthood clinics (which, like Perry, Deuell openly derides). Once FQHC contractors were funded, any remaining money could go to other providers, Planned Parenthood among them. The second rider directed an additional $5 million taken from family planning to create the Alternatives to Abortion program, a way to fund crisis pregnancy centers: unlicensed and unregulated “counseling” centers that encourage women to carry their pregnancies to term while providing no medical care whatsoever. 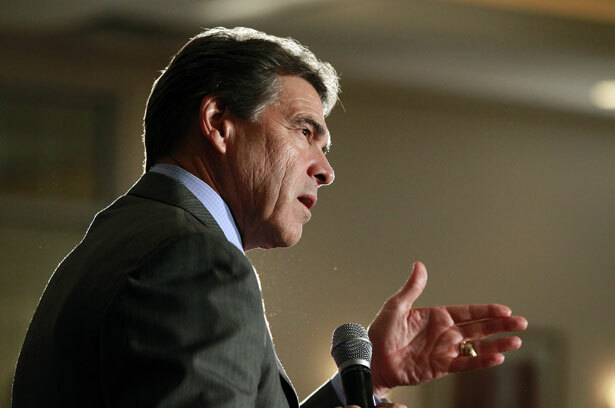 If cost-effective care was truly Perry’s objective, he would be investing in rather than attacking Planned Parenthood. Last year, 31 percent of the roughly 234,000 clients served with the state’s share of family-planning funds were served by Planned Parenthood at a cost of just $168 per client, Hagerty reports. In contrast, FQHCs served just 13 percent of those clients, at a cost of $225 per patient. $38 million left in the budget to serve uninsured women over the next two years, Texas will continue to be forced to fund FQHCs first. Next, the state must fund only full-service providers, and then, with whatever is left over, the state may fund stand-alone clinics like Planned Parenthood’s. The presumption, of course, is that there won’t be any money left. In fact, as it has turned out, there doesn’t appear to be enough money left to fund any of the “Tier 2” providers, either. For example, People’s Community Clinic has now lost an annual allocation of roughly $500,000 to provide services to more than 2,000 clients. Since September 1, fifteen contractors—most of them veteran providers—have been defunded, including six Planned Parenthood contractors operating twenty-nine clinics statewide. The effects have been devastating, says Wheat, and the nonprofit is relying on donors in the short term to continue serving as many clients as possible and charging new fees for services previously provided free. In Hidalgo and Starr counties, near the Mexico border, one of the neediest regions of the state, Planned Parenthood has been forced to close four clinics; Planned Parenthood Association of Hidalgo County estimates that 16,000 clients, 90 percent of whom live at or below the poverty line, will be dropped from services. In Dallas, Parkland Hospital, one of the state’s largest providers, served nearly 33,000 clients with $6 million in 2010; the hospital stands to receive just $1 million in 2012. 56 percent of all Texas births are paid for by Medicaid, which in 2009 alone cost the state $2.9 billion—the failure to fund preventive healthcare will lead to an increase in STDs, including HIV, which the state can ill afford. Since 2006, the first year for cuts to the family-planning budget, STD rates have skyrocketed in a number of Texas counties, according to calculations by data analyst Steve Wexler. This includes a nearly 68 percent increase in El Paso, 49 percent in Hidalgo and 44 percent in Harris County, home to the state’s largest city, Houston. With the severe cuts to the budget, Wexler estimates that rates will again increase in 2012. Then there is the teen pregnancy rate. Texas has the fifth-highest in the country, as well as the third-highest teen birth rate, and until recently held the title for most repeat teen pregnancies—a leading cause of school dropouts, which have also increased under Perry’s watch. In 2010 just 61 percent of Texas students graduated from high school. The movement is hardly confined to Texas. No sooner was Mississippi’s famed personhood amendment defeated in November than a similar one cropped up in Georgia. As the race for the Republican nomination heats up, candidates can be expected to pander to voters with increasingly radical measures.